Jayson Shaw won the lag, and that proved to be a bad omen for Rodney Morris because he sank 2 on the break and ran rack #1. Shaw broke dry, but benefited from the first in a series of fouls by Morris, and it led to an 8 ball runout. Morris fouled again, and Shaw ran out again to grab a 3-0 lead. Shaw’s best effort of the match came in game 4 when he played a precision long distance cluster break on the 6/9 and finished off his second break and run. After Shaw broke dry, Morris ran a few balls and fouled – again – and Shaw polished off a 4 ball runout. He then broke and ran for the third time to take a commanding lead of 6-0. In game 7 Shaw’s safety left Morris with a shot and he ran to a 7-9 combo to get on the board. But he made nothing on the break and Shaw made a 3-9 combo. Game 9 was an 11 turn marathon which Shaw eventually won after Morris committed yet another foul. In game 10 Morris ran to the 8-ball, but missed an easy straight in shot. Shaw capitalized on his blunder with his fourth and fifth break and runs of the match and now led 11 games to 1! In game 13 Shaw missed a routine medium length shot on the 7, handing the game to Morris. The Rocket then broke and made a 2-9 combo. In the next game Shaw missed a billiard on the 8-9, leaving Morris with unmissable 8-9 combo. Shaw fouled and Morris ran 5 balls, then broke and ran out to narrow the gap to 11-6. In game 18 it looked like Morris might win yet again, but he got bad shape on the 7 and missed a tough shot off the rail. Shaw finished that off, then broke and ran for the sixth time to win the match, 13-6. Shaw’s win was his fifth in the last six Turning Stone Classics and it came with first prize of $8,000. Rodney Morris earned $5,000 for coming in second. 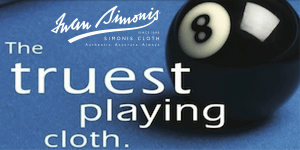 A BIG THANK YOU TO SIMONIS CLOTH!! I would like to express my appreciation to Ivan Lee and Simonis Cloth for making this coverage possible. Simonis Cloth and Aramith balls are being used in this event.